I’ve wanted to write about the topic of job advertisements for some time now. It’s played such a HUGE role at RZ with achieving BIG TIME candidate results. I’ve noticed that the right job advertisement has positive impacts directly with our own hiring efforts, and with our clients as well (we don’t preach anything we haven’t tried on ourselves). Better results ranging from 50% to 200% increases! Over the course of the past few months, we’ve been doing a ton of hiring for our own internal team (and for external clients) across the job boards and resume databases that are out there. And one thing I started to realize was that our results were lacking (volume-wise) and we weren’t really getting the right fit candidates. I sat there puzzled and then carefully read one of our ads. I thought to myself, it didn’t really stand out and just looked like all of the other ones out there, with simply bullets of what we “needed” from a candidate. I put myself in the job-seeker’s shoes and thought what would I REALLY want to know? A few things came to mind: one was transparency on salary, two was what it was really like to work at this company (eg. culture), and three what the role really entailed. According to a Wall Street Journal study, and insights from Enchanted Careers job advertisements that are more candidate-centric (e.g. catered to the job-seeker) on average yielded 185% better hiring results. Plus 95% of the candidates preferred well-written copy describing the culture of the company. The majority of job seekers reading job ads usually don’t read all the bullets and glance over them instead (e.g. bullets like, “Responsibilities, Duties, Requirements”, etc.). This comes as NO surprise because when I used to look for jobs back in the day, I was totally guilty of this! 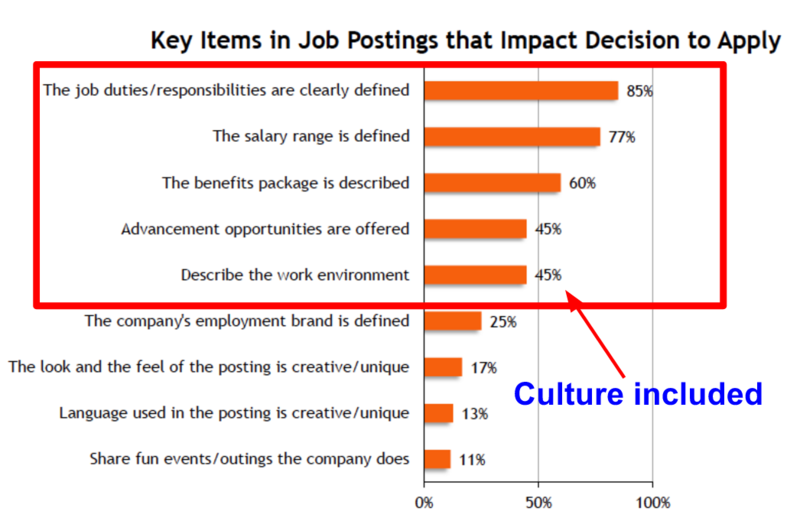 Finally, although salary was the most important according to many studies, a study from TheGoodJobs showed that 97% of job-seekers felt that culture is more important and/or as important as compensation. We all know that salary is one of the heavy hitters, but I found this insight about company culture very intriguing! So I know what you’re thinking: so many options to choose and why do some of the research reports contradict one another! Do I screen hard? Do I stick to the employer centric approach and clean up my copy? Or should I just do candidate-centric ads? I was thinking the same thing too. So what I decided to do was say “the hell with it, let’s test them all, and then measure the data!” In instances like this when you get contrary advice on what to do, the only way to know if something is working for you is to simply measure which of your different job ads are getting the most views, resumes, and quality candidates. After testing a wide variety of styles the results were insane! The most successful ads were candidate centric (describing culture), yet also the short and simple ones (Chet Holmes) performed very strong as well. The results for RZ clients and our own candidate search were 50-200% stronger. It was incredible. Anyways, right now all this snow coming down is making me want to grab a hot cup of cocoa but I’ll be creating a series out of this blog, because I think it’s extremely critical to attracting the right candidates. I’ll be following up with more findings over the next few months but in the meantime urge you to try some of these methods out yourself. In the meantime, happy job posting! These are good insights about what effective job description should look like. I think contrary advice happens because hiring situations are different: some positions require A-players, other need someone reliable and other hiring situations are constrained by budget. Do you think it would be possible to automate good job description writing? Or, at least, semi-automate that process? P.S. 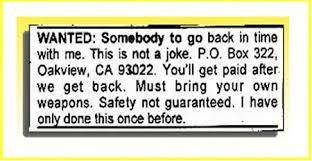 : Who do you think “back in time” ad was trying to hire? Dennis – thanks and great point. Now in regards to job description automation that would be really cool. That tickles my brain, some sort of algorithm maybe? I feel like you would have to collect company information first eg. culture, and different elements of that before proceeding into an automated process. But even then I’m not sure if you can get a machine to write as good as a human, unless you do something like AI haha. Surprised to not see one word about us in this article, knowing our conversation and the information that we gave you. However, it was nice to see that your testing proved what we taught you. That candidate centric advertising is much more effective than employer centric advertising. Hey Ken, thought I gave you guys a mention through TheGoodJobs. Didn’t realize you two were different companies though…Just added you guys in there. You guys put together a great webinar together – nice insights! Thanks Matt. We actually have a new version of the webinar which is shorter and has been well received.